Where do I use my Kickers voucher code? Pick your discount and copy the code provided. Follow the link through to Kickers’ website. Choose your shoes, select your size and add them to your basket. View your basket and click the ‘Have a discount code?’ button. Paste your code into the box provided and click ‘Apply’. Your savings will appear and you can then proceed to payment. Kickers offer free UK exchanges and returns, too - they figure if you’re not totally happy with your purchase, then why should sorting it out cost you extra? That’s alongside their low-cost delivery service, too, with options for standard and express shipping depending on what you prefer. 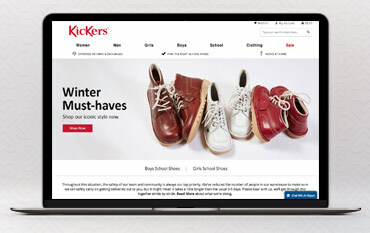 The Kickers shoe sale allows you to find the perfect footwear for less. With huge reductions on everything from boots to shoes to Kick Hi, Kick Lo, flip-flops, pumps, sandals, Star Wars themed shoes, patent shoes, metallic shoes and lace-up shoes. In the sale there are shoes for men, women, boys and girls, so the whole family can get a new pair of comfy and stylish Kickers. There’s plenty of shoes in the sale section that would be ideal for school, why not take a look and grab a bargain on high quality, leather shoes that you know will last. Many of the shoes in the shoe sale at Kickers are last chance to buy, so make sure you snap up a bargain before it’s too late. But don’t worry, with so many styles and new shoe collections added regularly you are sure to find your perfect pair of shoes in the sale. If not, you can always use our voucher codes and deals to cut the cost of your online order at Kickers. Women’s Kickers are stylish and smart, bringing an edgy vibe to timeless, sophisticated shoes. With so many different styles you can find Kickers for all uses, seasons and occasions. Choose a sturdy pair of boots for the winter months, a cute pair of patent pumps for work or casual days out or a nice pair of sandals for summer. You can find each pair of shoes in different colours and sizes, many of which also have big discounts, an added bonus when it comes to buying online. For additional savings make sure you check out our voucher codes and promotions before you buy, all of the codes and offers available can be found above on our deals page. Men’s Kickers are incredibly smart and classic. In the men’s section, there’s a plethora of lace up casual boots in a variety of colours as well as flat shoes, trainers, boots, slip on and smart shoes ideal for work or dressy events. All the men’s kickers available are made with the highest quality and craftsmanship, brought to you for excellent, affordable prices which bring an element of fun to buying shoes. As well as shoes you can also find shoe accessories like Kickers laces that can add extra style and versatility to your chosen shoes. Before you buy your shoes from Kickers be sure to head over to Netvouchercodes to grab a code or discount which can help you save money on your order. Kickers are an iconic brand, renowned for their timeless, top quality shoes that anyone can wear. Their collection includes a huge range of casual and smart shoes for men and women, as well as stylish, yet practical, kid's wear perfect for tackling those 'Back to School' woes. At Kickers finding the perfect pair of shoes is easy and affordable with our voucher codes and promotions that can cut the cost of your shoe order massively. Grab a Kickers voucher code and start saving money on your shoes with NetVoucherCodes.